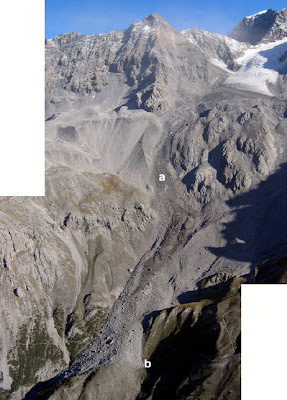 On September 18th, 2004 on the southern flank of the 3.641m high Peak Thurwieser (Ortler Alps, Central Italian Alps) a rock avalanche occurred, nobody was harmed and there were no damages to infrastructures reported. Nevertheless the event scared many mountain climbers (the peak is a popular goal) and caused a spectacular rock avalanche with an estimated volume of 2,5 million cubic meters, travelling in 80 seconds on the underlying Zebru glacier for 3 kilometres and stopping only 1.300m below the detachment area. Fig.1. Aerial picture of the area involved by the rock avalanche, the Thurwieser peak in the middle, the Zebru glacier on the right. The glacier is partially covered by the debris, while the moraines confine the propagation behind the rocky outcrops. Points A and B show zones of basal erosion (figure from SOSIO et al. 2008). The detachment of the rock avalanche exposes a reddish surface of weathered and fissured gneiss. 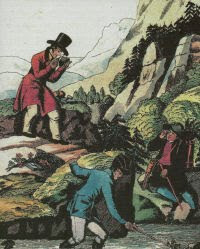 Tectonics and resulting fracturing of the rocks contributed to the weakening of the mass. The permafrost degradation is supposed to be the final triggering factor. Similar phenomena, even with lower volumes, have been occurring since summer 2003 in the Alps, for example in the Swiss Bernina Mountains, at the Matterhorn or Mont Blanc, following periods of exceptionally high summer temperatures. There is a spectacular video that documents the "flowing" of the rock avalanche and the dust raised by the rock fall extending for 4 kilometers.